I would say welcome back, but since I've been the one gone, I don't think that sounds too rational. Anyway, my vacation was very lovely and I'm even more happy to be getting back into the blogging swing. I have to say, its very boring out there when you can't check your twitter or stalk your tumblr for a good week, but the disconnect was wonderfully refreshing. I guess it was a good break for me to have. And speaking of breaks, I'm taking a break from my regular bedroom decor for the bright and vibrant colors of fall. Decorating for fall always puts me in a good mood and I think its all the vibrant colors that I get to fill my world with. 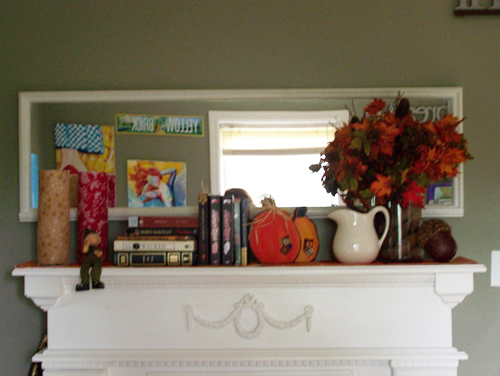 My mantle gets a whole new look, and my work spaces gets just a hint of a face lift. I change out the books piled up in places -- they all turn to Gothic novels or horror stories or monster mashups -- and fill vases full of very bright and sparkly leaves. For my mantle, its all about the details. Everything on it (and on my desk for that matter) are found pieces from our fall boxes and other parts of the house. The pumpkin pie looking runner was a scrap of material from my fall quilt. The pillar candle holders are glass covered with scraps of material and the pine cones filling the bottom of the vase on the right were found in Sequoia National Park in California and brought cross country with us. My favorite part is getting to change up my "featured" books. I love mixing classics with current fiction, hard backs and paper backs. 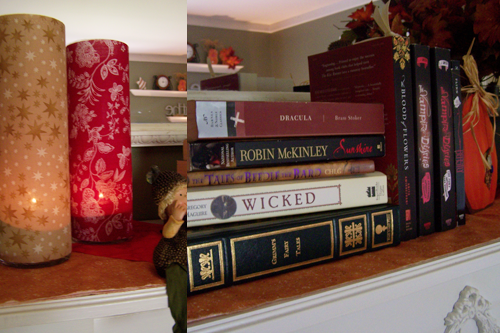 When in doubt, placing a copy of Dracula or Frankenstein amongst your fall decor, will add just a hint of that Halloween feel to the room. 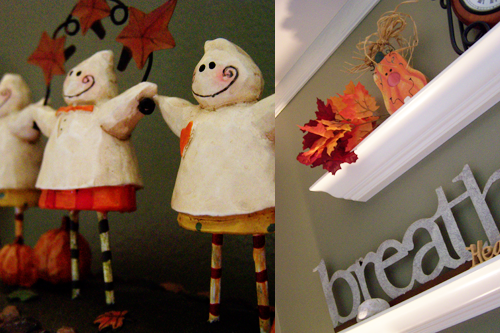 My work area gets a little face lift with another cut of pumpkin pie material and a few little fall details. Of course, moving some of my regular stuff around helps freshen up the corner. Like the mantle, its all about the little details. My only real Halloween item sits on the bottom shelf. While I would drown myself in Halloween creepy, I want to make my fall decorations sustainable for as long as possible. If you only put out a few Halloween-like items, it will give you an understated spooky and be easier to clean up at the end of October. Feel like filling your space with fall but don't have the time or funds to make it happen? I have 5 easy tips that will help you to fall-i-fy your room! 5. Put out something orange. Even if its place mats or a sweater. For fall, color is key and just a few little pops laying around will help change your color palette. Since there is more gold, red, and orange filling nature outside, your eye will be drawn to those same colors inside. 4. 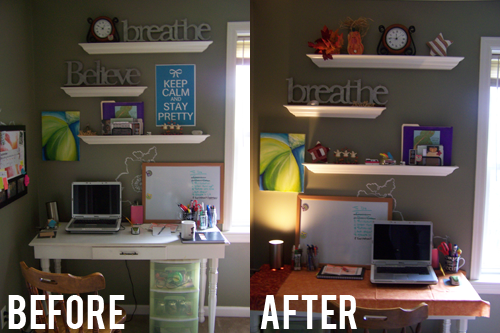 Rearrange your room. If you are putting out some fall items, don't layer them on top of your normal set up. Remove a few items and rearrange others. Trust me, it will make everything look fresher. 3. Put Halloween in context. Remember, fall lasts a whole month after that 1 spookatular night of the year. Adding just a few touches will make it easier to transition into Thanksgiving and help your look stay fresh after October. 2. A pumpkin spice candle goes a long way. Your nose is considered one of the best memory receptors. Smelling pumpkin, or spices that sing fall, will help put you in the autumnal mood. Pumpkin Pie Harvest is on sale at Christmas Tree Shoppes for 2.99. Just saying. 1. Deck out your computer/phone/nook with a new wallpaper. Your computer screen acts just like a picture frame for your desk. Filling it with the scenes of fall will remind you just why you're in love with the season, even if the view out your window doesn't look like New England in November.